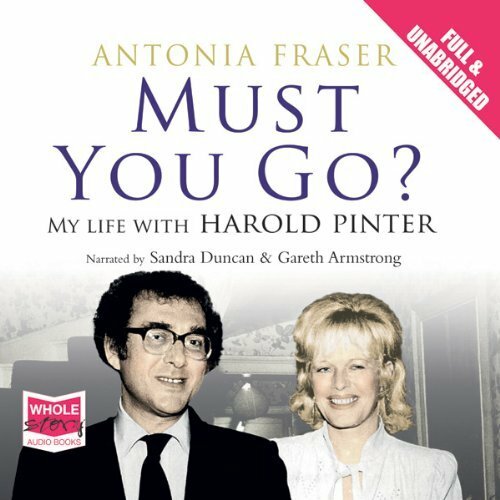 If there’s one thing you walk away with after reading Antonia Fraser’s memoir Must You Go, My Life with Harold Pinter, it’s that she and her second husband Harold Pinter were deeply in love. Reading a memoir that doesn’t focus exclusively on tribulations its author has overcome is refreshing. Remarkable, even. Fraser has chosen to share what appears to be the happiest period of her life. And in the process proves Tolstoy wrong. At a party in 1975 Antonia Fraser was involved in a conversation that included the playwright Harold Pinter. She was taking her leave when Pinter turned to her and asked “Must you go?”. And there it began. Both parties were married – Antonia with six children. The affair continued until 1977, when she divorced her first husband in the amicable manner that seemed to be the defining characteristic of their marriage. Pinter’s separation from his wife, the actress Vivien Merchant, was less amicable. The British tabloids had a field day and Merchant refused to sign the divorce papers until 1980. Fraser and Pinter married that same year and lived happily together until his death of cancer in 2008. This 35 year period is told to us through excerpts of Fraser’s journals with some narrative explanation. She appears to be a rabid diarist – never missing a day. Which is funny when you consider that she’s a biographer by profession, accustomed to perusing her subjects’ diaries, letters and papers in the course of her research. The entries that make up the book are not so much stream-of-conscious ramblings or emotional outpourings as they are concise cataloging of the day’s most interesting events. Fortunately Pinter and Fraser lived interesting lives and knew interesting people – so most of their days together are worth re-visiting. The name dropping that takes place on these pages is almost shameful! Jackie-O, Salman Rushdie, Samuel Beckett, Philip Roth… the list of literati seems never-ending. But her commentary is never salacious. These were the circles the couple traveled in, and as you read you get the sense that Dame Fraser would never commit the impolitesse of gossiping about friends. I really enjoyed Must You Go, as I have every book I’ve ever read by Antonia Fraser. It may not be for everyone, though. One Goodreads reviewer negatively compared Must You Go to “reading a daytimer”, and to be fair the description isn’t far off. It is this gift of brevity – Antonia Fraser’s ability to capture a moment in a deftly executed prose sketch – that makes her memoir so charming. Little jokes, witty descriptions, notes left on the pages by Pinter (which she welcomed) – it is the description of a full life encapsulated in a few lines a day. Fraser had the sense not to overwork the prose, or expand too much on the things her audience already knew. At times her admiration of Pinter seems almost worshipful, but the book was published 2 years after his death. Her loss is fresh. She obviously misses him. Equally obvious is her happiness in remembering. Is it a complete picture? Probably not. But Must You Go is a glimpse into their private world. Fraser has every right to choose what she shares. The audio version, which is what I listened to, is narrated by the incomparable Sandra Duncan. Her inflections are flawless. The 11 hours and 14 minutes moved by quickly, the only off note being the choice made to have the poetry by Harold Pinter which is referenced throughout voiced by a man. Whether it would have flowed so well or been so entertaining to read in book form, I’m not sure. I tend to think it would be. Yet there was something delightfully intimate about hearing it read (it’s written in the first person) as if Fraser was relating the stories over tea. In fact, I intend to avoid interviews given by the real Antonia Fraser. If her true voice differs too much from Duncan’s I’ll be devastated.